Animal Defenders International : Animals in entertainment : Wild animals in circuses and other travelling shows denied “life worth living”. Animal Defenders International (ADI) has called for immediate action to end the suffering of wild animals in circuses in Britain after a comprehensive and expert analysis of scientific evidence found “all five of the ‘freedoms’” are compromised in travelling animal shows. Experts said that circus life for animals is one not “worth living”. The Harris team consulted 658 experts and organisations around the world including 138 animal trainers/circuses, 206 lawyers/veterinarians with expertise in wild animal welfare, 107 people working for NGOs, 144 biologists, researchers, behavioural and species experts, 58 zoo and wild animal sanctuary staff and relevant government officials and wildlife experts. The views of the animal trainers and circuses were “very different to the other groups of experts” on several issues. The group “did not believe that frequent training is stressful for animals”, that the “frequency and duration of transport should be minimised to avoid unnecessary stress”, and “disagreed that the portable enclosures required for regular travel cannot meet the preconditions for good welfare” – in contrast to all other expert groups. “Traditional animal training methods are coercive and based on force and aggression”. Circus trainers “have few or not recognised qualifications or formal training”. Lesley Griffiths, Cabinet Secretary of Environment and Rural Affairs has stated that the Wales Animal Health and Welfare Framework Group would be drawing up “detailed options on the next steps regarding the use of wild animals in circuses, as well as further considerations on the use of all animals in MAEs”. The issue of animal circuses has become an embarrassing parliamentary saga, with various governments promising to take action since 2006. In 2009, ADI exposed the abuse of elephants with the Great British Circus. The ensuing outrage led to a Defra consultation in 2010 which saw almost 95% of respondents back a ban on wild animal acts. In 2011, ADI exposed how Anne, an elderly elephant with Bobby Roberts Super Circus, was kept permanently chained and physically abused, resulting in a cruelty conviction for her owner. Backbench MPs responded with a unanimous vote for a wild animal ban, and a year later the Government agreed to pass legislation. A Government bill was drafted in 2013, but has been left to gather dust. In an unprecedented political and parliamentary commitment, for the 2015 General Election the Labour, Conservative, DUP and Green parties all included manifesto commitments to ban wild animals in circuses – 98% of MPs are committed to action. Wales and Scotland have both pledged to take action on the issue. Changing attitudes and awareness of animal suffering have seen the number of wild animal circuses in Britain plummet, with opinion polls commissioned by ADI consistently supporting a ban for over a decade. Only two circuses are currently performing in England with wild animals, Circus Mondao and Peter Jolly’s Circus, but with no bar to wild animal circuses in place, the door is open to others joining them. The continued use of wild animals in circuses is opposed by animal welfare experts, animal protection groups, politicians and a huge majority of the public. The Federation of Veterinarians of Europe (FVE) has concluded “there is by no means the possibility that their [wild mammals in travelling circuses’] physiological, mental and social requirements can adequately be met.” and the British Veterinary Association that “The welfare needs of non-domesticated, wild animals cannot be met within a travelling circus - in terms of housing or being able to express normal behaviour.” A 2009 research paper co-authored by Professor Harris concluded “the species of non-domesticated animals commonly kept in circuses appear the least suited to a circus life”. 32 nations around the world have now restricted either wild animals, or all animals, from travelling shows. It is time for the UK to become top of this list. Once a ban is in place, ADI has offered to assist with the relocation of circus animals, should the need arise. ADI has just this year concluded an operation to enforce similar legislation in Peru, rescuing and relocating over 100 animals, with 33 lions airlifted to a sanctuary in South Africa. Take action to stop circus suffering! In Wales contact your AM, in Scotland your MSP, and Northern Ireland your MLA and urge them to call for action too. 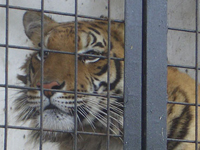 Donate today and help us campaign for an end to the suffering of animals in circuses.